1 A None No Power Seat 1 A is a Business Class Bulkhead seat. The close proximity to the galley may be bothersome. 1 B None No Power Seat 1 B is a Business Class Bulkhead seat. The close proximity to the galley may be bothersome. 1 C None No Power Seat 1 C is a standard Business Class Bulkhead seat. 1 E None No Power Seat 1 E is a Business Class Bulkhead seat. The close proximity to the lavatory and galley may be bothersome. 1 F None No Power Seat 1 F is a Business Class Bulkhead seat. The close proximity to the lavatory and galley may be bothersome. 19 A None No Power Seat 19 A is a standard Economy Class seat. The close proximity to the lavatory may be bothersome. 19 B None No Power Seat 19 B is a standard Economy Class seat. The close proximity to the lavatory may be bothersome. 19 C None No Power Seat 19 C is a standard Economy Class seat. The close proximity to the lavatory may be bothersome. 19 D None No Power Seat 19 D is an Economy Class seat in the last row of the section that may have limited recline. The close proximity to the lavatory may be bothersome. 19 E None No Power Seat 19 E is an Economy Class seat in the last row of the section that may have limited recline. The close proximity to the lavatory may be bothersome. 19 F None No Power Seat 19 F is an Economy Class seat in the last row of the section that may have limited recline. The close proximity to the lavatory may be bothersome. 19 G None No Power Seat 19 G is a standard Economy Class seat. The close proximity to the lavatory may be bothersome. 19 H None No Power Seat 19 H is a standard Economy Class seat. The close proximity to the lavatory may be bothersome. 19 J None No Power Seat 19 J is a standard Economy Class seat. The close proximity to the lavatory may be bothersome. 20 A None No Power Seat 20 A is an Economy Class Exit Row seat with extra legroom. The close proximity to the lavatory may be bothersome. The tray table and TV are in the armrest, making the armrest immovable and slightly reducing seat width. 20 B None No Power Seat 20 B is an Economy Class Exit Row seat with extra legroom. The close proximity to the lavatory may be bothersome. The tray table and TV are in the armrest, making the armrest immovable and slightly reducing seat width. 20 C None No Power Seat 20 C is an Economy Class Exit Row seat with extra legroom. The close proximity to the lavatory may be bothersome. The tray table and TV are in the armrest, making the armrest immovable and slightly reducing seat width. 20 D None No Power Seat 20 D is an Economy Class Exit Row seat with extra legroom. The close proximity to the lavatory may be bothersome. The tray table and TV are in the armrest, making the armrest immovable and slightly reducing seat width. 20 E None No Power Seat 20 E is an Economy Class Exit Row seat with extra legroom. The close proximity to the lavatory may be bothersome. The tray table and TV are in the armrest, making the armrest immovable and slightly reducing seat width. 20 F None No Power Seat 20 F is an Economy Class Exit Row seat with extra legroom. The close proximity to the lavatory may be bothersome. The tray table and TV are in the armrest, making the armrest immovable and slightly reducing seat width. 20 G None No Power Seat 20 G is an Economy Class Exit Row seat with extra legroom. The close proximity to the lavatory may be bothersome. The tray table and TV are in the armrest, making the armrest immovable and slightly reducing seat width. 20 H None No Power Seat 20 H is an Economy Class Exit Row seat with extra legroom. The close proximity to the lavatory may be bothersome. The tray table and TV are in the armrest, making the armrest immovable and slightly reducing seat width. 20 J None No Power Seat 20 J is an Economy Class Exit Row seat with extra legroom. The close proximity to the lavatory may be bothersome. The tray table and TV are in the armrest, making the armrest immovable and slightly reducing seat width. 27 A None No Power Seat 27 A is an Economy Class seat that is missing a window. 27 J None No Power Seat 27 J is an Economy Class seat that is missing a window. 29 A None No Power Seat 29 A is an Economy Class seat that may have limited recline. The close proximity to the lavatory may be bothersome. 29 B None No Power Seat 29 B is an Economy Class seat that may have limited recline. The close proximity to the lavatory may be bothersome. 29 C None No Power Seat 29 C is an Economy Class seat that may have limited recline. The close proximity to the lavatory may be bothersome. 29 G None No Power Seat 29 G is an Economy Class seat that may have limited recline. The close proximity to the lavatory may be bothersome. 29 H None No Power Seat 29 H is an Economy Class seat that may have limited recline. The close proximity to the lavatory may be bothersome. 29 J None No Power Seat 29 J is an Economy Class seat that may have limited recline. The close proximity to the lavatory may be bothersome. 3 C None No Power Seat 3 C is a standard Business Class seat. The close proximity to the galley may be bothersome. 3 D None No Power Seat 3 D is a standard Business Class seat. The close proximity to the galley may be bothersome. 30 D None No Power Seat 30 D is a standard Economy Class seat. The close proximity to the lavatory may be bothersome. 30 F None No Power Seat 30 F is a standard Economy Class seat. The close proximity to the lavatory may be bothersome. 31 D None No Power Seat 31 D is an Economy Class seat in the last row of the plane that may have limited recline. The close proximity to the lavatory may be bothersome. 31 E None No Power Seat 31 E is an Economy Class seat in the last row of the plane that may have limited recline. The close proximity to the lavatory may be bothersome. 31 F None No Power Seat 31 F is an Economy Class seat in the last row of the plane that may have limited recline. The close proximity to the lavatory may be bothersome. 4 A None No Power Seat 4 A is a Premium Economy Class Exit Row seat with extra legroom. The tray table is in the armrest, making the armrest immovable and slightly reducing seat width. There is no floor storage for this seat during take-off and landing. 4 B None No Power Seat 4 B is a Premium Economy Class Exit Row seat with extra legroom. The tray table is in the armrest, making the armrest immovable and slightly reducing seat width. There is no floor storage for this seat during take-off and landing. 4 C None No Power Seat 4 C is a Premium Economy Class Exit Row seat. The close proximity to the galley may be bothersome. The tray table is in the armrest, making the armrest immovable and slightly reducing seat width. There is no floor storage for this seat during take-off and landing. 4 D None No Power Seat 4 D is a Premium Economy Class Exit Row seat. The close proximity to the galley may be bothersome. The tray table is in the armrest, making the armrest immovable and slightly reducing seat width. There is no floor storage for this seat during take-off and landing. 4 E None No Power Seat 4 E is a Premium Economy Class Exit Row seat. The close proximity to the galley may be bothersome. The tray table is in the armrest, making the armrest immovable and slightly reducing seat width. There is no floor storage for this seat during take-off and landing. 4 F None No Power Seat 4 F is a Premium Economy Class Exit Row seat with extra legroom. The tray table is in the armrest, making the armrest immovable and slightly reducing seat width. There is no floor storage for this seat during take-off and landing. 4 G None No Power Seat 4 G is a Premium Economy Class Exit Row seat with extra legroom. The tray table is in the armrest, making the armrest immovable and slightly reducing seat width. There is no floor storage for this seat during take-off and landing. 5 B None No Power Seat 5 B is a standard Premium Economy Class seat. 7 A None No Power Seat 7 A is a standard Economy Class Bulkhead seat with extra legroom. However, the tray table and TV are in the armrest, slightly reducing the seat width. 7 B None No Power Seat 7 B is a standard Economy Class Bulkhead seat with extra legroom. However, the tray table and TV are in the armrest, slightly reducing the seat width. 7 C None No Power Seat 7 C is a standard Economy Class Bulkhead seat with extra legroom. However, the tray table and TV are in the armrest, slightly reducing the seat width. 7 D None No Power Seat 7 D is a standard Economy Class Bulkhead seat with extra legroom. However, the tray table and TV are in the armrest, slightly reducing the seat width. 7 E None No Power Seat 7 E is a standard Economy Class Bulkhead seat with extra legroom. However, the tray table and TV are in the armrest, slightly reducing the seat width. 7 F None No Power Seat 7 F is a standard Economy Class Bulkhead seat with extra legroom. However, the tray table and TV are in the armrest, slightly reducing the seat width. 7 G None No Power Seat 7 G is a standard Economy Class Bulkhead seat with extra legroom. However, the tray table and TV are in the armrest, slightly reducing the seat width. 7 H None No Power Seat 7 H is a standard Economy Class Bulkhead seat with extra legroom. However, the tray table and TV are in the armrest, slightly reducing the seat width. 7 J None No Power Seat 7 J is a standard Economy Class Bulkhead seat with extra legroom. However, the tray table and TV are in the armrest, slightly reducing the seat width. All seats come with a choice of up to 120 albums/channels. All classes on this plane offer personal video screens with 40+ TV features. Business class comes equipped with 15-inch personal IFE screens; Premium Economy comes equipped with 12.4-inch personal IFE screens; Economy comes equipped with 8.9-inch personal IFE screens. Business, Premium Economy, and Economy Class feature powerports and USB ports at every seat. Complimentary food and beverage service is available on long-haul flights for all classes. This Boeing 787-8 aircraft seats 252 passengers in a three-class configuration and is used on international long-haul routes. 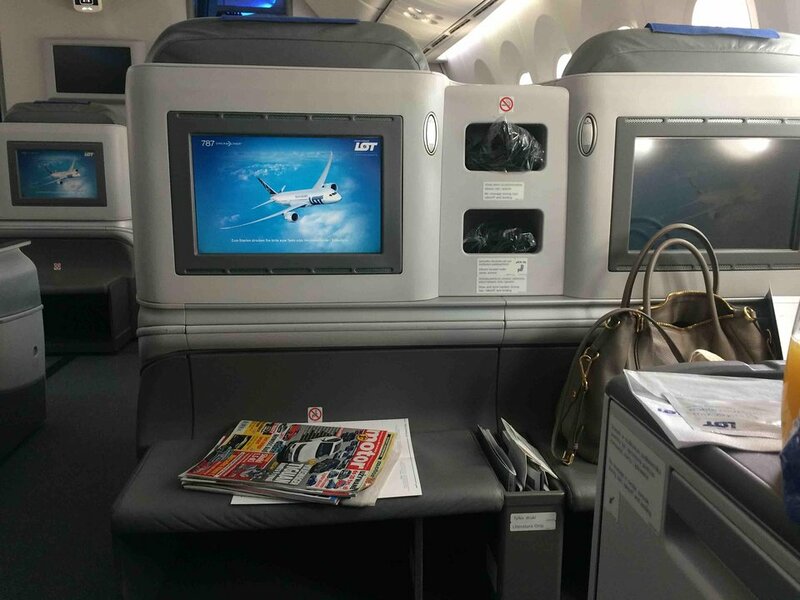 There are 18 Business Class seats which LOT Polish calls Elite Club, 21 Premium Club seats, and 213 seats in Economy. The middle seats 2C and 2D are very bad for sleeping: every time someone is passing by both seats are bouncing. for my point of view the bottom is not firm enough. Window seats are much better. Despite increased front legroom, this seat has width restricted even further due to exit door extending toward seat space. I was unable to use this seat and had to be re-seated for a fee which is bad. I want to warn everyone not to choose this seat neither 20A which has same restriction as 20J. The TV is unusable during taxi, takeoff and landing. The seat width is significantly reduced due to the immovable armrests. Would be best to avoid this seat on long haul flights. The food was okay and the service was nice. With most airlines those seats are taken out leaving only a double seat on the windows side in the last row of the economy cabin. The narrowing curve of the tail part of the fuselage makes a shoulder space very restrictive (about 10 cm more narrow than the rest of the window seats), forcing passenger to seat on the angle throughout the flight. Very uncomfortable. The seat has extra leg room for sure, which is great. However, both the passengers and the flight attendants treated it as a thoroughfare to cross from one aisle to another which was extremely annoying. Putting legs up with feet touching the wall didn't stop those people, they would just climb over your legs and step on your feet. If you decide to pay extra for these seats, be warned. Also the seats are somewhat more narrow with hard walls on the sides, so I wouldn't recommend them to heavier people, as they simply won't fit in them. The economy seats on this plane are extremely small (I am 5 foot 5 inches tall). In addition, my in-flight entertainment system did not work. They tried to "reset it" and it still didn't work. There were no empty seats to switch to. The man in back of me was so tall that he had his feet up on the back of my seat or on my armrest the entire flight. It was like having a small child kick my seat the 8 hour trip. He said he could not change his legs due to how small (I was not reclined) the legroom space was for him. I pressed the call button and was not visited by the staff for about an hour, at which time they pretended to not understand what I was saying. Disappointed. Nice, new, smooth airplane with the smallest seats ever. Pay up or fly a more reasonably sized plane on a different airline. Flew in seat 3D Business class from LAX to Warsaw. The two middle seats (C & D) are both aisle seats. Great seats, no complaints, and only closets behind you. Would sit there again. BTW, other reviewers have correctly pointed out that the window seats in Business Class have an issue in that you cannot get to the aisle without climbing over people in seat B or E when aisle seats are in full flat recline position. This is fine if you are a couple in A/B or E/F, but no so good if you are solo in window seat. All premium economy seats have tables in armrests ..not only row nr 4 , so also 5 and 6 . Avoid this seat on a long-haul flights! It is very comfortable, BUT you can not get out of it when both seat in from of it are full reclined back. There is simply no room, even for a skinniest person, to get up and go to the WC unless you wake up people in front of you and ask them to put their chairs in the upright position.I had to climb up and stand on my chair and then climb to the neighbor seat and then get out. Boeing Dreamliner is a great airplane, but, boy, the designers did not use their brains measuring this! I was very disappointed with this "premium" class. Get the aisle seat. As a true connoisseur of economy seating I was fairly impressed with LOT's longhaul product. The 787 is very comfortable and I found seating to be spacious enough that I didn't suffer despite being 6'2". Service was pleasant and the food was OK. Washrooms were remarkably nice for int'l longhaul, with the ones at the rear being the best choices (I think many people never think to head to the back of the plane). Good inflight entertainment setup with wide selection of TV shows, moves and even some games. I was pleased. No one had anything but positive comments for the First Class travelers which from my experience was AMAZING. I flew in seat 1C to Madrid and seat 2B from Madrid. The first flight started in MIA and the second flight was returning to MIA. We were on the flight back when New Years occurred (in Europe) and they did a massive celebration with confetti, wine, etc. for about 15-20 minutes and it was really great. Tight seat but at 5'9'' /160 lbs it was tolerable for the flight to Warsaw from Chicago. Plenty of bin space so carry on was not a problem. Got vegetarian meal and it was not very good. Premium Economy is about $1000 more and I'll put up with the minor discomfort and save the cash. Seat sucked - does not recline and in LOT 787-8 configuration this seat also does not align with window so bulkhead bumps out into seat area. I took seat number 6F of LO80 (Premium Economy from Narita to Warsaw) in June 2017. This seat has a narrow leg room and I could not recline the seat like the other ones in the Premium Economy class. This was totally a bad seat. Also I could hear the noise from the Economy class behind. I asked the stewardess to change my seat to 21G which was the Economy Class. It was so strange that 21G was much better and more comfortable than 6F. I recommend you not to sit on 6F or 6B! It is waste of money. Seats are just OK but nothing fancy.Plane looks dirty with carpets that need to be chnaged,you have to pay for beer and wine in economy and this is weird.I lost a good deal with Lufthansa and a week later I paid 40% more with LOT.Not recommended for the money! I've just been travelling on this seat and no galley noise was bothering to me. The wall behind is a wardrobe, and then bulkhead. Galley is way closer to the premium class, not business. I flew on a LOT flight from JFK to WAW and vice versa for a few years now. I take the night flights to WAW, and the afternoon flights back. So far, have to say the new dreamliner is very impressive. On my experience the biggest delay I had was about an hour, due to a bad storm passing JFK. Throughout the flight, the entertainment system is very nice, and there is multiple drink services with two food services. You can also buy snacks in the rear galley for a fair price. The experience is in economy is basically the same in every seat, but my personal favorite was the aisle seat in the back. It was very quite and comfortable, with direct access to the lav and galley. Being polish but born in the US, I have to say the flights attendants language was very fluent, and they were very kind and helpful throughout the flight. DEFINETLEY recommend flying lot!! This is an excellent seat. I'm 188 cm and I can stretch my legs fully. Super convenient. The food was also really good, as well as the service. I had 4B empty next to me so I even tried that out. This is almost as good. However, you might risk stretching your right leg into the isle. 19 G is a very bad seat. Not only is it close to the lavatory but half of the seat is unprotected by the back wall so everyone bumps or leans on this headrest. Very annoying. LOT 1st class seats fully recline to a flat bed. This location depends on others to darken windows. Also, location is not conducive for individuals to walk in front to get to other party members which is a plus. Good seat if you don't care about being near a window. Service is average, amenities below average, entertainment outdated and limited. First time flying LOT business. These middle seats are very good and of course offer aisle access. Very spacious cabin. Service was friendly and good - better than United / Lufthansa. The only drawback is entertainment - limited and older English content. Best to bring an iPad with movies. I disagree with comment for 20A. This is not a good seat in any respect. Yes, it does have huge extra legroom, but the emergency door protrudes a few inches into the cabin. Because of that you need to keep your left leg inclined inwards. This, combined with the narrow seat, additionally made narrower by armrest traytable, makes journey EXTREMELY uncomortable (and for men also quite unhealthy). Yes, there is lots of legroom, but this does not compensate for the fact that you need to seat for hours with your legs squeezed tightly together. 20B and C are perfectly fine, but 20A (and 20J) should be avoided, I'd paint them RED. 7A on the other hand was very good. Legroom is smaller than in 20A, but width of the cushion, even reduced by table and monitor, was not an issue (and I'm not exactly small at 100 kg/175 cm). The width of the seat may be a challenge here, but it is on the shoulder level, and it's just the feature of the economy cabin on this plane (so you might want to use aisle seat instead). There is an electronic box under the seat in front. This prevents stretching fully one's right leg, leading to an uncomfortable skewed position to sleep. Otherwise, great seat and service for value. The seat I sat in had a fantastic view of the wing and engine. Although the leg room is a little small, It was still a lot for such a big plane. I had a night flight from jfk, so most people were sleeping, but wasn. Instead I enjoyed some snacks I bought and watched some great movies. Later on there was 2 meal services and drinks were constant. I found the recline very generous and the headrest was comfortable. I love to fly on LOT and im actually flying next week again on lo27!!! Premium economy on LOT is what Business class was 20 yrs. ago. Good, reasonably wide seat reclining to about 45 degrees, Excellent food and drink (including superb Zubrowka wodka), attentive crew, very quiet plane. All in all excellent value for money on ORD-WAW. And they posted the miles on UA mileage plus faster than UA itself does... within 24 hours of arrival. Warsaw to JFK in 3C+3D, really good new plane, the space you have for your seat is by far bigger than on other european carriers flying across atlantic, these seats especially have extra high ceiling as it rises from the row 2, so much leg room and no footholes, good choice of movies with a big private screen, staff were mostly really polite but one really rude, the only let down i would say is the food quality, the service is good though. Definitely my new choice for flights from Europe across atlantic! This was an Air Europa flight utilizing the 787 DreamLiner operated by LOT for the transatlantic portion. My first time in Business Class in 4 years and the first time in a 787. Seats were comfortable in flat mode once you tweaked them a little to achieve a zero gravity kind of setting. Crew was great as was the food. Disappointed in the entertainment selection though. Movies were the same on the way over and the way back, and pretty lame. Luckily I prioritized sleeping on the way over so was able to find a couple of movies I enjoyed on the way back to MIA. Overall, a great value - about half the cost of a business class ticket on American Airlines, and with fully reclined seats! 2C and 2D were ideal for the West to East overnight flight, as you can get up to use the restroom without having to climb over and disturb your partner. The console with the TV screen /armrest between seats A and B is very massive and long. So once the seat in front is reclined, the console touches the back of that seat. This means that if you need to leave, you actually have to climb over it or ask the person in seat in front of you to rise their seat to upright position. Very inconvenient actually. Bathrooms for Premium Economy on this plane are past row 19 in regular coach, not in front in business class, which is also inconvenient. Flight is not really quiet as some may assume, Dreamliner has strong vibrations that are bothersome on long flight. Food and service however is great. Very comfortable seat, enough space for legs (I'm 5'13''). Acceptable entertainment system. Pleasant flight. We (two people) sat in the last row of this plane on our trip to Beijing from Warsaw. The seat does not have limited recline, but no recline at all. I like this plane, as it is very modern and has a natural lighting inside. The windows dont have shutters, but an electronic dimming system that is still translucent when dark. This is a very positive feature and you can look outside even when the windows are dimmed at night/morning. The seat itself was kinda cramped and I recommend booking two seats apart when you're two people travelling together. No one will sat between the window and aisle seat, but sleeping was still a pain. There is just not enough space! The food is very good and there are many new series and movies to watch. Our recommendation is first row in Business Class. The best!!!!! We flew on this plane on May 22, 2015 coming back June 06, 2015. The flights were excellent. Four adults, one 9 year child. We had a feeling we pushed the button in Toronto and we end up in Warsaw and vice versa. We had good night sleep. Perfect. If you travel by plane more than couple of hours take only Business Class. It is worth the money you are paying. LOT allowed two cats to travel in Business Class - two sets of passengers each with a cat. I am allergic to cats - and was told that I could travel in economy (not even economy premium)- I took my meds and decided to try to manage. One cat was kept in carrier. Other cat was kept on owner's lap during takeoff and landing, with owner using a toy on a stick to amuse cat even during turbulence. Wrote to LOT Customer Care VP over 5 weeks ago asking for an explanation and still no answer. Somehow does not seem like Customer Care. Try getting out of a window seat to visit the head. Unless you crawl over the seats (with armrests up) you feel like a spider. I have flown Lot to Warsaw seven times. I was much more comfortable in the 767 which had 2-4-2 seating. On top of all the discomfort was the insult of not being able to choose your seat in advance unless you wanted to pay extra. Shame on you Lot. Another airline going to pot because of greed. I travelled on this plane on 28 April 2015 from London to Warsaw. The plane broke down on the runway, and had to be repaired (delay of more than one hour). The flight itself was later quite ok. While pitch (I'm 6'5'') is acceptable, the seat width is horrible. The armrest literally tries to grow into your lap. Fortunately I'm slim enough, but I wouldn't wish anyone who is a bit oversized any longer flight on this plane. Entertainment system is quite limited, but for a two-hour flight it was just about ok. All in all I'm a bit dissapointed, especially that the LOT is my national airline. There is back ground noise from the galley, but if it is a problem, simply put on the great headphones they provide and peace reigns. Read the other reviews for this plane - everyone who travelled in the front thinks it's great. Everyone in economy says it's terrible. There's a reason for that. Now look at the seat map. The front third of the plane holds 40 people. The rear 2/3 of the plane hold 220 people. Yes, it's that bad. The pitch is tight but tolerable if you're under 5'8, which I'm not, so I "upgraded" to an exit row (row 20). While the legroom is great, the already laughably narrow seats are further reduced by the TV and tray table being in the armrests. If you weigh more than 170lbs, you don't fit - don't even try. In any of the economy seats, you will find yourself constantly negotiating with your seatmates as to whose shoulder is in whose back and for what duration. Yes, about 20% of your torso width overlaps with your neighbour. It is absolutely laughable that they think 3 adults could ever fit in this configuration. To add insult to injury, every single row in economy had at least one empty seat, so they could have easily gone 3x2x3 and given everyone more than ample breathing space. If you are independently wealthy, the front of the plane is absolutely luxurious. If you're in economy, do yourself a favour and pick a different airline. As for the plane itself - a marvel of modern technology. It's awesome. Simply awesome, but the seating debacle quickly overshadows the large, niftily-tintable windows and nice restrooms. I flew this plane/airline on 12th August 2014, excellent flight. 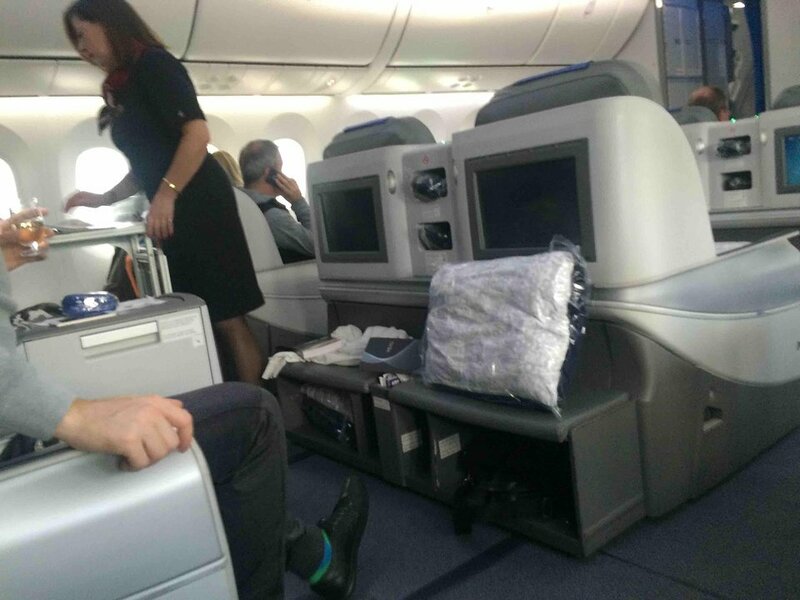 Nice plane, one of the very best seats on European carriers in Business class. usual width for the seating, flat seat 180 for sleep, but wide space for feet. Too often other airlines offer a small narrow space for the feet. Here one can spread. Food was good, in the upper average for this type of flight. Service excellent, staff really available. Entertainment a bit limited, but this is an overnight flight, I slept 5 hours. Nice new Boeing 787 with large windows. Warsaw airport is now in EU Schengen zone, so no hassle whatsoever. On my way to Geneva, this was a perfect alternative to usual KLM, Lufthansa etc. To be included in your options. Row 7 is a bulkhead row, which means that you have extra leg space. The seat is quite roomie, eventhoug the armrest is immovable, since the traytable is in it. 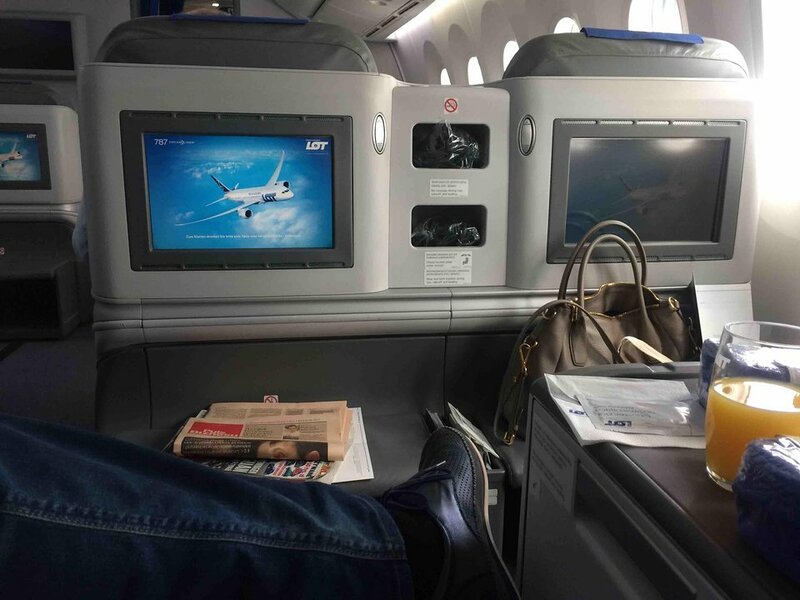 The Screen is also under the armrest, which means no viewing during taxi, takeoff and landing. 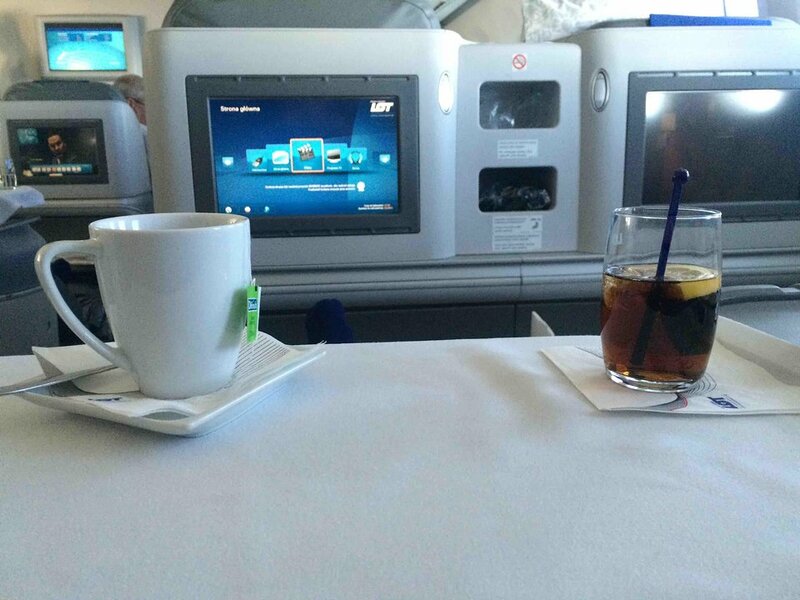 You also get food/drink serivce first because you're in the first economy row. This 787 is so over-packed that it is absolutely unexceptionable. If the last time you flew on a commuter jet and thought I really wish that I had these seats on a transatlantic flight, this is for you. I don't know about all window seats, but 9J had something sticking out from the side killing any room under the seat. My laptop bag didn't fit. The flight attendants didn't even notice that it was not properly stored because we were packed in so much. For reasons unknown to me Lot has ordered these with seats that are a half inch more narrow than other airlines that fly the 787. From now on, I'm choosing airlines that fly 8 across A330s, 9 across 777s, or 10 across 747s to Europe. 9 across on a 787 is just to narrow for a long haul flight. Beware when flying this airline. 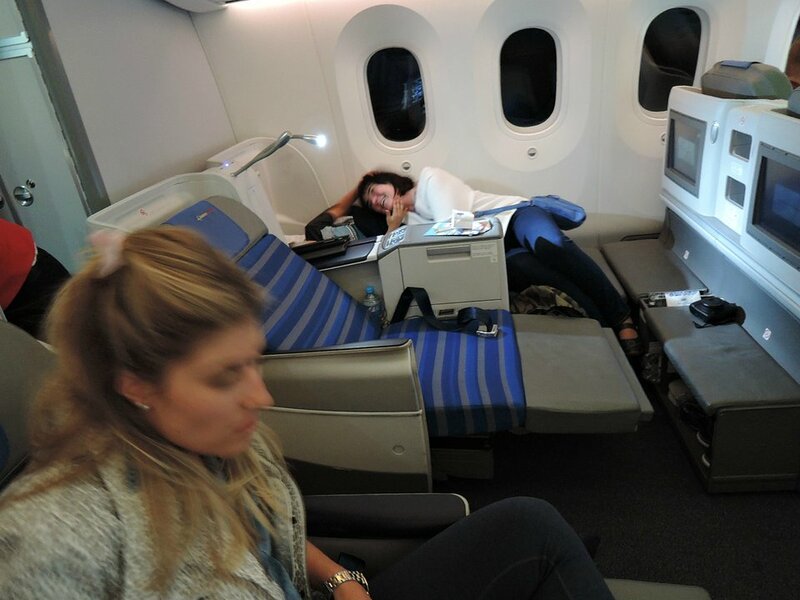 Yes, the flight is great in business class. However, if your bag arrives damaged dont expect the airline to fix it. Additionally, if you dont check in 24 hours dont expect your business class ticket to still be available as I was bumped from business to economy because the flight was oversold on one of my legs of my journey. They have not compensated me at all. Pay the extra money to fly another airline. LOT is horrible. Truly unbelievable trip! The flight attendants were beyond courteous, the food was excellent, and the plane speaks for itself. Tons of room at my seat, comfortable in all positions, great views through the oversized Dreamliner windows from any part of the plane. I highly recommend a trip on LOT. Seriously, the Dreamliner has raised their game from pretty bad to one of the best. Entire economy class in the new LOT Polish Airlines is a complete disaster. The 3x3x3 seats combination are awfull, there is absolutely not enough room for 3 adults to sit next to eachother and have a decent flight. The chairs are thin, hard and in about half time of the intercontinental flight, your body parts have had enough. Now I understand economy class, but nowadays the tickets are hugely expensive and passengers are treated like cargo. the enterntainment system for economy class practically non existent. If you want to watch some better movies or drink a beer you got to pay. The food tasted like cartboard and only very few flight attendants are nice. Compare to premium economy/business class where they are all over passengers. This whole inequality depends how much dollars you are spending. Where are the times when flying was a pleasure? Seat was very comfortable. Service excellent. Good selection of alcohol, mediocre food. Very comfortable and spacious Business Class lie-flat seats. The service was superb, excellent food and wines although the entertainment system is somewhat outdated. Warsaw-Toronto on July 25, 2013. B787 is a superb airplane and Lot's new livery is just beautiful. It was a brand-new airplane. The seats were very comfortable, the service was excellent, and the prices were very competitive to business class airfare offered by legacy airlines. LOT offers many connections via Warsaw to other West-, Central-, and East-European destinations. It is an airline that I would recommend. LOT Polish Airlines flies 1 versions of Boeing 787-8.